Stranded on an island full of crabs. Escape on a self built raft. But every time the raft has drifted far enough from the island, an intense swell from beneath, out of the depths of the ocean, breaks it into pieces. And everything starts from scratch. 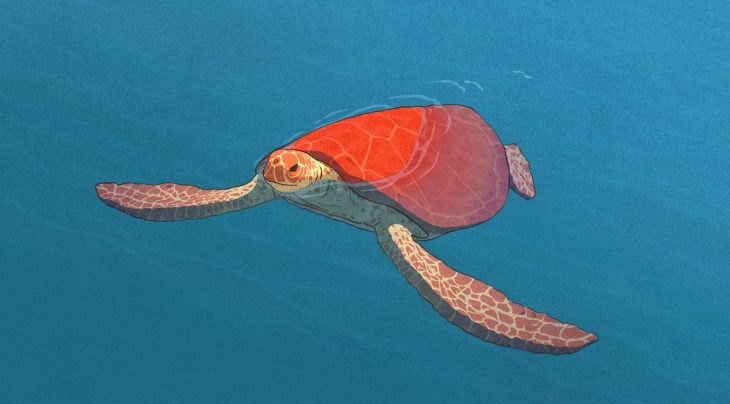 That’s the beginning of “The Red Turtle”, Dutchman Michael Dudok de Wit’s first feature length animation movie. Fortunately he continues to make movies in the way that made his award-winning short films “Father and Daughter” and “The Monk and the Fish” so unique and unmistakable. His story still manages without a single spoken word, and he still relies on natural drawing materials for his backgrounds. It was Dudok de Wits purism in his practice of the art of animation, that connected him with the people, who now have made his first full-length feature possible. None other than Hayao Miyazaki the founder of Studio Ghibli, made him the offer. His partner, legendary animation film maker Isao Takahata, has worked as creative producer on “The Red Turtle”. Studio Ghibli’s first international co-production is loud and silent, slow and fast, a meditation utterly at peace with itself, about life and the love therein. A stream of pictures opening up thoughts and emotions, that are then given back to the world with an enormous amount of happiness.